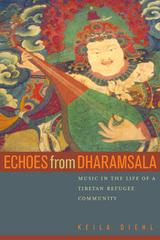 In Echoes from Dharamsala, Keila Diehl uses music to understand the experiences of Tibetans living in Dharamsala, a town in the Indian Himalayas that for more than forty years has been home to Tibet's government-in-exile. The Dalai Lama's presence lends Dharamsala's Tibetans a feeling of being "in place," but at the same time they have physically and psychologically constructed Dharamsala as "not Tibet," as a temporary resting place to which many are unable or unwilling to become attached. Not surprisingly, this community struggles with notions of home, displacement, ethnic identity, and assimilation. Diehl's ethnography explores the contradictory realities of cultural homogenization, hybridity, and concern about ethnic purity as they are negotiated in the everyday lives of individuals. In this way, she complicates explanations of culture change provided by the popular idea of "global flow." Diehl's accessible, absorbing narrative argues that the exiles' focus on cultural preservation, while crucial, has contributed to the development of essentialist ideas of what is truly "Tibetan." As a result, "foreign" or "modern" practices that have gained deep relevance for Tibetan refugees have been devalued. Diehl scrutinizes this tension in her discussion of the refugees' enthusiasm for songs from blockbuster Hindi films, the popularity of Western rock and roll among Tibetan youth, and the emergence of a new genre of modern Tibetan music. Diehl's insight into the soundscape of Dharamsala is enriched by her own experiences as the keyboard player for a Tibetan refugee rock group called the Yak Band. Her groundbreaking study reveals the importance of music as a site where official and personal, old and new representations of Tibetan culture meet and where different notions of "Tibetan-ness" are being imagined, performed, and debated. Keila Diehl is a Fellow in the Humanities at Stanford University.